Whether you’re a merchant categorizing your inventory, a marketer breaking out custom labels in Google AdWords, or just simply naming folders on your company server – it is crucial to have a standardized naming convention. Organized and well thought out naming conventions streamline business process, makes the application intuitive, and allows future changes to be manageable for other users. 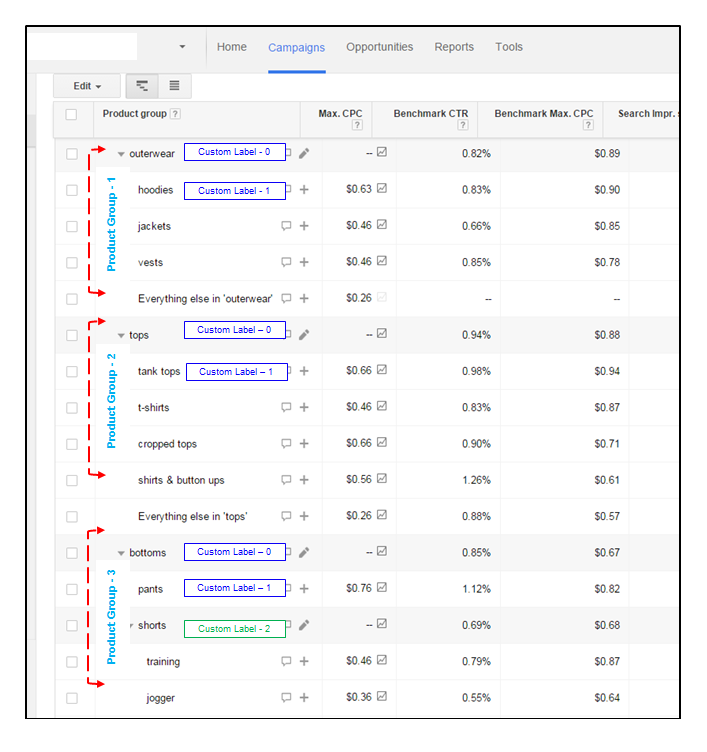 When you are setting up your shopping campaign, product groups are segmented into lower levels using attributes and custom labels. This helps marketers effectively target bids on a class of products based on the clients’ business goals. Breaking out custom labels can be confusing, but think of it tangibly: you are a store owner and you are organizing your inventory. In doing so, you must identify what you are selling and what is unique to each category of products. Start at the top. Build the product hierarchy by identifying the highest category of products. To make things simple, an apparel retailer sells tops and bottoms. In this example, we will begin building custom labels for tops. For Custom Label 1, fabric type will be used (i.e. knits and wovens) since these two fabrications typically sell differently. What else is unique to your product? 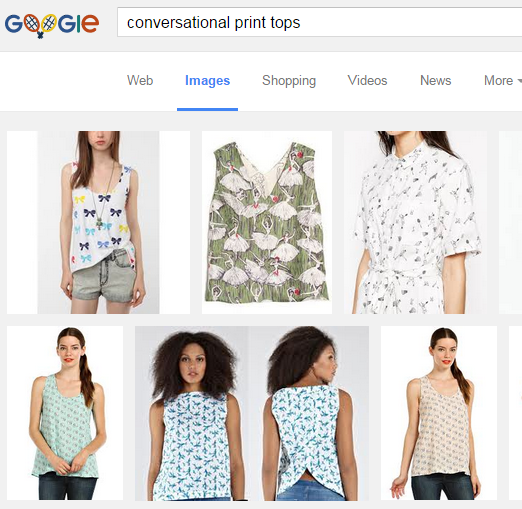 Conversational tops – or printed tops, are popular in fashion. Some prints may be more significant than others, so it may be valuable to break out the different print types (i.e. floral, hearts, owls, skulls, cats). Since there is a limit of 5 custom labels per product group, it is important to leverage your custom labels/attributes in a way that will help you manage your clients’ advertising goals. Ambiguity: Be sure to have one theme per custom label. If a product falls into more than one custom label (i.e. 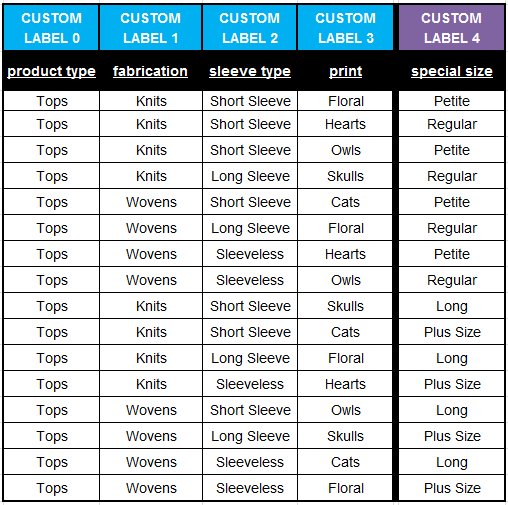 a top that has printed cats and hearts), make the decision to either override the product with the dominant custom label, or create another custom label for that product. Not manageable: Use labels that can be easily updated and tracked. The Best Practice – Organize! Review new products on a weekly, monthly, and seasonal basis to make sure they are consistent with the existing naming convention. For your reference, keep a running log of changes in the instance there is a data feed or custom label restructure. Be on the lookout for returning products listed under a different SKU/Product ID. Stay consistent, and be on the lookout for anomalies. Create a process that will override ambiguous product names, without compromising what the veracity of the product. As a rule of thumb – make it simple, applicable, manageable, and consistent. Need to make a change? Remember to keep your business partners in the loop! Last, if you need help optimizing your data feed with your custom labels to improve your bid management strategy, contact us. We can apply this process to increase your visibility and decrease your CPC.